Last year it was all about trying as many mushroom colours as I could, which meant using commercially spun yarn. But I got more pleasure this year from spinning the rovings I dyed with mushrooms, and that’s where I want to focus my efforts next year. These yarns were made of wool dyed with the dermocybes – Cortinarius semisanguineus and their cousins. 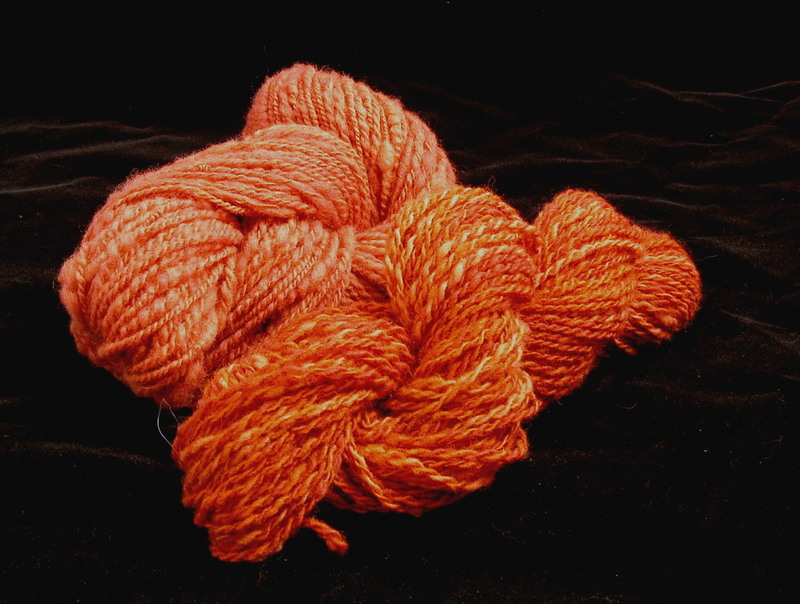 The skein on the left is a textured yarn, made by spinning thick and thin. I spun the one on the right using wool from three exhausts of the same dermocybe dyepot. I pulled off small pieces of roving and spun the three colours one after the other. I ended up with two bobbins of this, which I then plied together. It made such a rich medley of shades, I had trouble putting it down! These skeins have both gone to good homes, and I hope to see what their owners do with them. 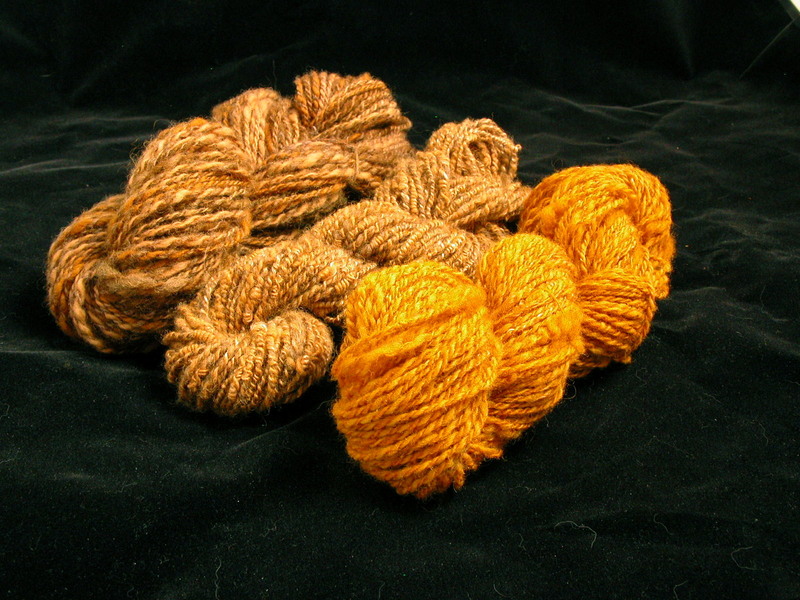 These skeins were made with fibre dyed with Phaeolus schweinitzii, or dyer’s polypore. The left skein was again made with rovings from three exhausts of the same dyepot, spun fairly thick and with a lot of texture. The next skein is a knot yarn; I plied an evenly spun wool singles with a finely spun silk singles, which I allowed to knot upon itself throughout the plying. The silk gives it a fine sheen, and the knots give it a wonderful texture. The skein on the right was made from the brilliant gold rovings I got from the button dyer’s polypores I mentioned in an earlier post. I spun this thick and thin, to get some real texture going. These, too, were snapped up by knitters who appreciated their one-of-a-kind value. I love my skeins of mushroom dyed yarn and look forward to getting to knit later on this year ..or maybe next !! it is very close now. Great to meet with you at Dunbar. Beautiful ! I love those colours.